Crocodiles have been roaming Egypt for millions of years. Cairo’s leaders figured it was about time they cashed in on it. 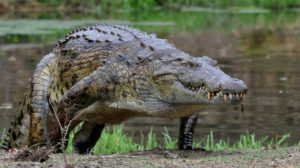 Egyptian Environment Minister Khalid Fahmi outlined a plan to export crocodiles as a new source of foreign currency for a country whose tourist industry has suffered after major terror attacks. One Nile crocodile sells for up to $400. Egypt’s foreign currency reserves have dwindled from their peak of 36 billion dollars in 2010 to 19 billion in October of this year. Fahmi said a site has been designated for breeding crocodiles in Lake Nasser behind the high dam in Upper Egypt where there are an estimated 3,000 crocodiles at present. The Nile crocodile is the largest in Africa and generally regarded as the world’s second-largest after the saltwater crocodile. The average size of the Nile crocodile ranges from 4.5 meters to 5.5 meters. Fahmi said that Egypt’s potential export of the Nile crocodile has become possible after the Convention on International Trade in Endangered Species of Wild Fauna and Flora (CITES), an inter-governmental pact aimed at protecting wild animals and plants, approved trade in crocodiles under certain restrictions. “CITES no longer prohibits Egypt from exporting the Nile crocodile. But until now, unlike other African countries, Egypt has not got an export quota because we have no experience in breeding crocodiles,” Fahmi said.